Robert Blackwell, born on Long Island, earned an A.B. degree from the College of New Jersey (now Princeton University) in 1768 and a D.D. in 1788. He went on to become an Episcopal minister in New Jersey and in Pennsylvania, serving most notably as rector of Christ Church in Philadelphia. During the American Revolution he served as a surgeon and chaplain with the 1st Pennsylvania Brigade in the Continental Army. This man of learning was named a member of the American Philosophical Society in 1785, three years before Princeton granted him the degree of doctor of divinity. He was associated with Penn as a trustee of the College and Academy of Philadelphia from 1789 to 1791. 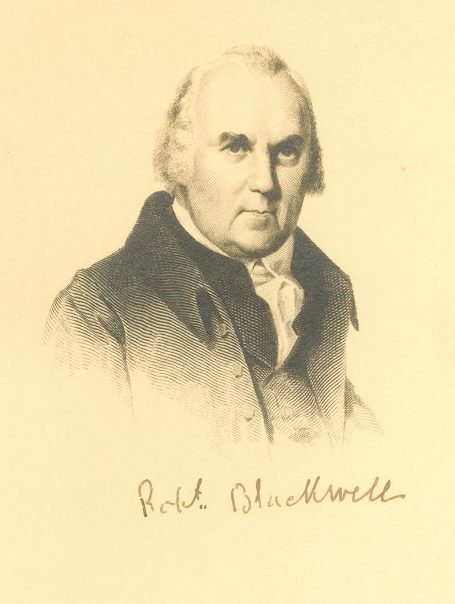 After the union of the College with the University of the State of Pennsylvania to create the University of Pennsylvania, Blackwell served as a trustee of that institution from 1799-1822. Blackwell died in Philadelphia in 1831.